This was supposed to be a hard one. My first Thanksgiving after… you know. But in fact, it was one of the nicest days I’ve spent in a very long time. I am so incredibly blessed. I had prepared for this. I had prayed in my “healing light prayer box” for this day (see previous posts). I had talked to my counselor about it. She gave me lots of good tips: have no expectations; it’s all meant to be; have fun; B R E A T H E.
My stepdaughters could not be with me. Each, for their own reasons. The pain was too deep. They missed their father too much. This was their first holiday with both of their parents gone. I understand. Those are sad times and sometimes the work of creating a holiday is just too much work, and one must do it differently in order to survive. Initially, I was hurt. Yes, it stung, but I do understand. It’s OK. And in fact, with the day unfolding so differently from years past, I was able to relax and enjoy the unexpected. One of my daughters came and she brought her dad because she did not want him to be alone. He had come to our home in years past, when my husband was alive, so it wasn’t as completely weird as that might sound. We spent the entire day cooking together. We remembered our own parents and grandparents – and their traditions. We laughed at memories of the good old days. We argued over old recipes and promised that we would sit down and write them all down before they were lost forever. We didn’t. We ate. A lot. We made toasts to all of our family, those here and those in heaven. 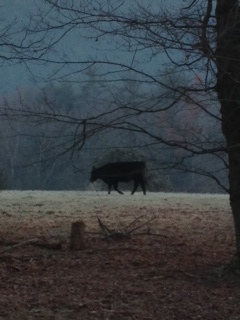 My daughter back east called from West Virginia and emailed a picture of the Thanksgiving Cow that showed up in their yard! We shared hugs and butterfly kisses via the Internet — high-tech blessings, all! Thank you, God, for this wonderful day. Yes, I miss him so much and I will for a long time to come. God, please watch over my stepdaughters and help them to find their way. Thank you for my daughters and for their unfailing love. Thank you for letting me see that life does, in fact, go on. The sky is so clear and blue. The trees are bright red. There is leftover pie. The air smells like burning wood. A cow is lost but will soon be found. Christmas is coming. This entry was posted in Uncategorized and tagged bereavement, cows, faith, God, grief, healing, hope, inspiration, memories, photography, Thanksgiving, therapy. Bookmark the permalink. Well turns out the cows escaped from a farm across the river and if we see them again we are supposed to call. LOL! What’s so funny about this, and I forgot til now, is that one year, when we were little, a cow escaped from somewhere and we all looked up from the dining table to see a “real cow” staring at us through the window! I love your pic of that cow! It’s a beautiful photo! FANTASTIC !!!!!! I’m thinking about you , Sue, and our SPARKY !!!!! Sounds like a beautiful day with lots to be thankful for. Yes, Jan, thanks. It was! Hope your day was good too! Great pic. Great insights. Glad it was a good day.